The AWF was a strategic partner of the 7th World Conference on Women and Sport. The first Conference was hosted in Brighton, UK, in 1994 and the AWF celebrated the history of the IWG at the 6th World Conference in Helsinki, Finland, four years ago with an exhibition and various presentations. With over one thousand delegates registered, the Conference is of vital importance to advocates of women and sport globally. Due to the importance of the Conference, we wanted to maximise the opportunity for WSLA graduates wishing to attend. Since November 2017, we had invited applications for a Conference Bursary comprised of AWF funding. Seven ‘AWF Leaders’ were supported to attend via waivers in their registration fees, a contribution to accommodation costs, and payment of travel expenses. We were very proud to continue to offer development opportunities to women sport leaders. Some of the women had attended WSLA Botswana and were able to stay in Gaborone for a few more days to experience the Conference. "WSLA Botswana changed my life, when I applied to be a facilitator for the programme I was excited and scared at the same time but deep in my heart I knew that I will be with extraordinary women who support each other and are willing to assist each other. The sessions also helped me as an individual to learn how to run a program and I’ve learned the skills and techniques of how to facilitate. We may share the same problems, but everyone has a unique way of dealing with the issues. It is important to share our ideas to tackle the issues. "The IWG Conference was a popular and powerful platform to participate and gather key and vital information on how women sports leaders can influence sport in the future by being change-agents in the present. The topics were carefully selected and provided good information on different global women sports issues. The conference provided a fertile platform for likeminded women sports leaders, sports organisations and institutions to learn and share best practices as they explored areas of synergies for future partnerships. I had an opportunity to interact with the chief women football officer at FIFA as she provided insight on their women’s programmes. Additionally, I had a chance to interact with Kenyan academics and had conversations on reviving and strengthening Kenya women sports network. 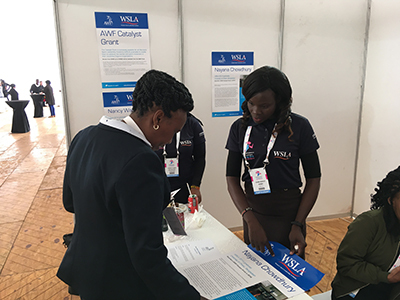 The AWF Leaders helped to generate exposure about the AWF during Conference breaks, including at our exhibition stand. Joan tells a delegate about the Catalyst Grant projects. 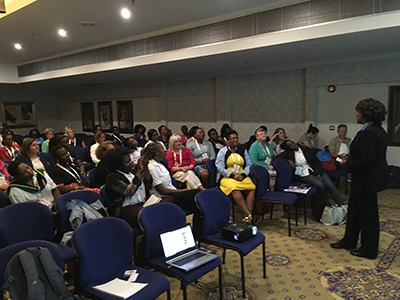 During the AWF parallel session, Malebo (WSLA 2017, Botswana) reflected on how WSLA had given her the confidence to become the president of Botswana Netball. Nancy also told the audience about how AWF funding had enabled her Catalyst Grant project to develop. Aya (WSLA 2016, Japan) presented her research on gender equality in Japanese Olympic Sport. 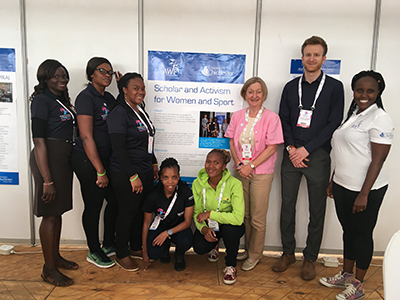 In the same session, Lombe presented part of her PhD study about narratives of activism among African women sport leaders, and Jordan outlined the Women and Sport Timeline. Elsewhere at the Conference, Elizabeth (AWF co-founder), Jordan and Professor Kari Fasting presented a keynote session on the opening morning that provided an overview of the IWG Progress Report 2013-2018. The two-year project asked 158 organisations a range of questions centring on what actions they had undertaken to advance women and sport. We recognised that much more monitoring and evaluating research is needed, in order to measure the impact of these actions. The areas where fewest actions have been taken are: improving how girls and women in sports and/or physical activity are portrayed in the media, child-care provision and protecting female athletes from developing eating disorders. 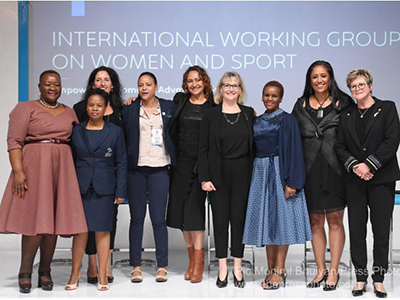 Our recommendations informed the legacy of the Conference – The Botswana Big Five – a set of strategic goals to guide the work of the IWG as its secretariat moves to New Zealand for the 8th World Conference on Women and Sport in Auckland in 2022. Anita also delivered a keynote session celebrating the legacy of previous IWG conferences. She reflected on her role in the formation and development of the IWG, as well as identify lessons learned, during the closing session of the Conference. 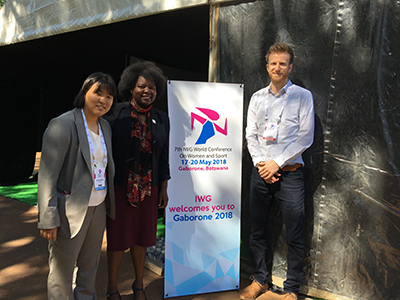 Advocacy has been central to IWG Conferences and Lombe played a central role in the launch of the Women and Sport African Network (WSAN) – an independent network providing a regional mobilisation platform for collective action to advance and celebrate women and sport in Africa. Lombe expertly navigated technical issues during an early-evening session where WSAN was introduced to delegates. Seventy predominantly African attendees shared thoughts on what they envision the future of the network to be. WSAN appears to be the regional legacy of the Conference for Africa.